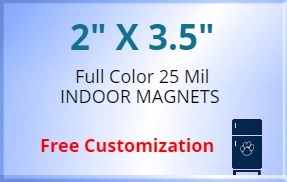 Customized 2x 3.5 business card magnets -25 mil is a reliable choice for you, if expecting long term ROI. This laminated magnet offers best visibility, protection and reliability to your business information. You can get it customized with business information of your choice prior to handing it during promotional events. It is offered in attractive price range, which means you can grab price savings on bulk orders and still expect to make impressions. It can be considered for bulk gifting throughout the year. Request a quote to know attractive price savings that can be made on bulk orders of custom 2x3.5 business card magnets – 25 MIL.